'Faversham Creek firing the engines' was my first painting since the 1960's. I had kept my oil paints for 50 years, with the intention of painting at some stage in my life. As a child I was denied the opportunity, as I had passed a scholarship and was led (dragged) into an academic lifestyle. All seven of my family were artistic and I always felt it was wrong for none of them to use the talent they had and I vowed to do so myself one day! And I did, starting in earnest in 2008, amazed that all of the oils were usable. 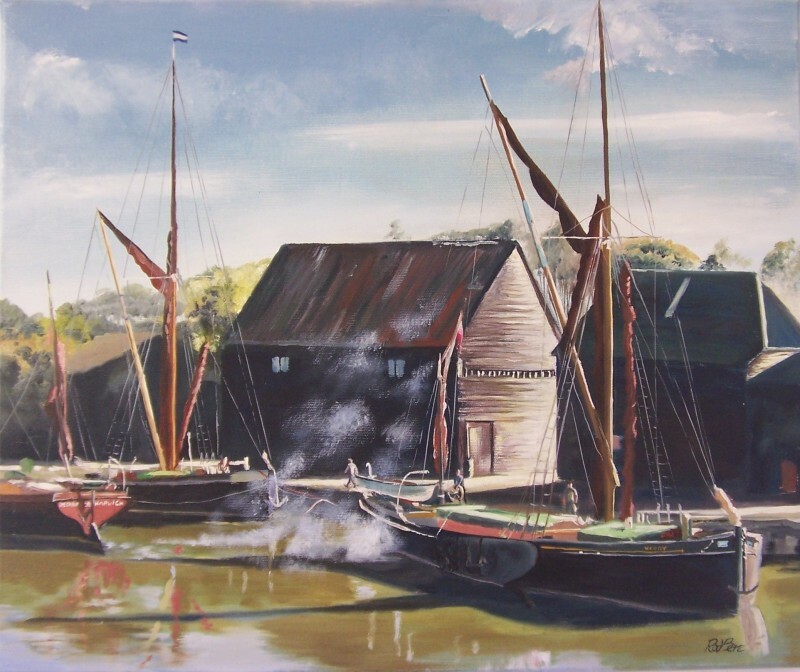 I sat on the creek at Faversham and this painting was the result. As I sat there the first boat fired her engines and moved from the dock and it was so calm with the sun low in the sky, the smoke from the engines floated and hung across the water. Since then I have been fascinated by water and its reflections and used it many times as a subject. 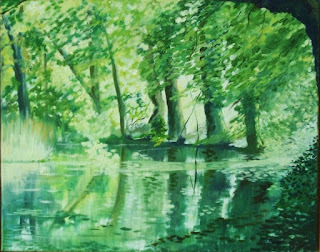 Although this painting probably has no artistic merit it was a start and within a week or two I was selling paintings in a local gallery which really spurred me on. 'Spring' was carried out in 2009 and inspired by a hospital visit. I had to go for an xray one Sunday morning and entering the hospital realised that there were no other patients. I wandered through several empty waiting rooms and although not my first visit, for the first time I noticed that on every wall there were Monet prints. Many I had never seen before and I was so inspired. 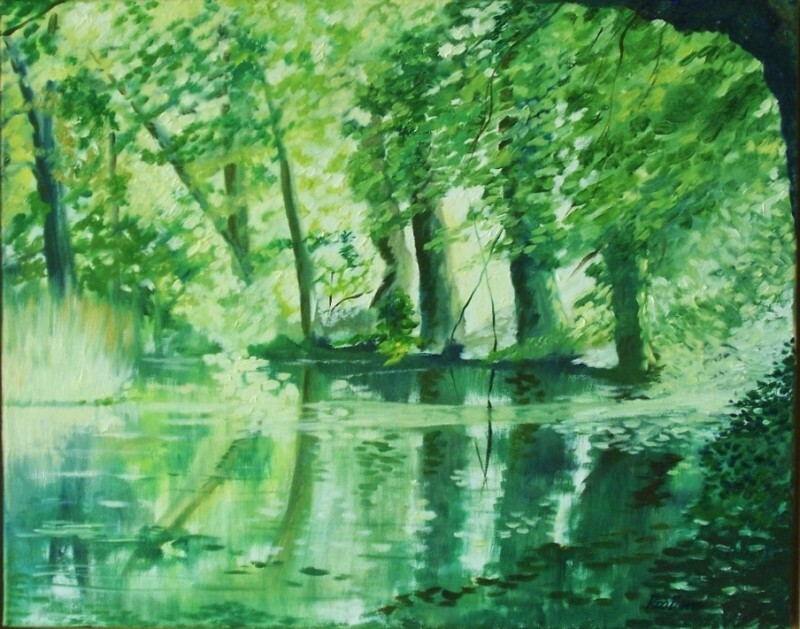 As soon as I was back home I painted this picture based on a pond I knew well. Using shades of one colour it only took about 2 hrs and I realised this is what I should be doing. I am influenced a lot by my time as a youth farming, having been born in London the memory of rural light and scents really fire my imagination. Having lost many years of learning and realising a sense of urgency, I still paint very quickly. Without sketching, I start instantly with a large brush, blocking in all the shadows and background tints and then adding the sunlight. I have never had any teaching, but feel I am learning very quickly. I currently sell on average 3 paintings a month which is a terrific inspiration to do more.